“John Lennon: The Green Album” opened Sept. 7 at the Smithsonian’s National Postal Museum and coincides with the U.S. Postal Service’s issuance of the John Lennon Forever Stamp, honoring the legendary singer and songwriter. The stamp is the latest in the Music Icons stamp series. The exhibition will be open through Feb. 3, 2019. Lennon (1940–1980), along with Paul McCartney, George Harrison and Ringo Starr, achieved superstardom as the rock and roll band, The Beatles. However, before Lennon travelled the globe playing music with The Beatles, this boy from Liverpool, England, saw the world in a completely different way—through stamps. Lennon’s childhood stamp album, which includes 565 stamps on more than 150 pages, will be on display, along with a tribute to previously issued U.S. Postal Service Music Icons stamps, including those honoring Lydia Medoza, Johnny Cash, Ray Charles, Jimi Hendrix, Janis Joplin, Sarah Vaughn and Elvis Presley. W. Wilson Hulme, the museum’s curator who acquired Lennon’s album for the museum in 2005, said at the time, “There are people who think stamp collecting isn’t cool, and maybe this will cause them to think twice about that. It just doesn’t get any cooler than John Lennon.” During the intervening years, the museum has shown the album in Stockholm and New York City, but it has not been displayed in Washington, D.C., since 2006. Years before his rise to fame as a musician and member of the Beatles, Lennon was a schoolboy in Liverpool, England, when his older cousin, Stanley Parkes, inspired Lennon’s interest in stamp collecting and gave him his stamp album. Lennon rubbed out Parkes’ name and address on the album’s flyleaf, replacing it with his own signature and the address at Mendips, the home he shared with his aunt Mary (“Mimi”) Smith and her husband George. Already a budding artist, Lennon sketched beards and mustaches in blue ink of the likenesses of Queen Victoria and King George VI on the album’s title page. 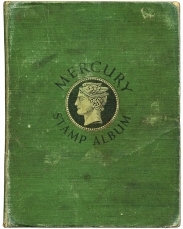 Lennon continued to collect and trade stamps for several years after receiving this album. According to Parkes, Lennon began collecting at about age 9 and actively collected stamps for several years. There is evidence throughout the album that Lennon added and removed stamps. Lennon’s handwritten notes on the flyleaf indicate the album may have contained as many as 800 stamps at some point.